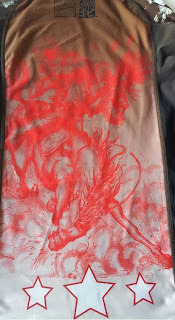 Short Review: The Gentle Chief features a stylish comic-book design from Gawakoto, gracing a very comfortable rashguard, judging by the Medium I was sent. I prefer my nogi equipment to be a tight fit, to benefit from the compression: that's definitely the case with the Gentle Chief. The construction is high quality and sturdy, apparently with not only anti-bacterial and anti-odour properties, but SPF 50 protection from the sun as well. The only flaw I noticed was a lack of trimming on the inside, but that was just a factory error on the particular one I was sent, which hasn't impacted on its functionality. Available to buy here, or from Gawakoto here. Full Review: 93 Brand has only been on the market for around a year, but it has the considerable advantage of being headed up by Aaron Rubin. 93 Brand can therefore benefit from Rubin's considerable portfolio of e-commerce websites, most notably BJJHQ.com. 93 Brand is effectively the 'house brand' of BJJHQ.com and Rubin's other major site for BJJ merchandise, the pragmatically named Martial Arts Supplies. At present, the loose theme of 93 Brand is Americana (as in, American culture and history, rather than the submission). There's been a 'Made in America' rashguard, the 'Goose' gi (named after two things: geese are grey, like the gi, then there's the Top Gun character called 'Goose') and now the 'Gentle Chief', drawing on imagery from cowboys and Native Americans. The actual design is by Bong Abad (sublimated, as normal for modern rashguards), the artist behind Gawakoto. According to the website, "Gawa ko ‘to" is Filipino for "I made this", paying homage to Abad's ethnic roots. Abad's background is in comic book art, something I'm fond of myself. In my case it's mainly been the numerous titles attached to the X-Men, along with old Conan the Barbarian (or Cimmerian, if you're more of a Robert E Howard purist) comics, plus some of the obvious classics like The Sandman. There is a major downside to comic book art: it can be deeply flawed with regards to its representation of women (as discussed here). Keeping that in mind, it's still a genre I enjoy. 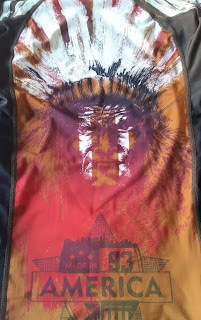 The image Abad has created for the 'Gentle Chief' reminds me a little (though it might just be because of Dani Moonstar, a Native American superhero) of my personal favourite example of comic book art, back when Bill Sienkiewicz had a stint on the original New Mutants in 1984-1985. I've been a fan of Abad's work for a while (especially this, this, this and this, appealing to my love of fantasy), but this is the first time I've had a chance to get my hands on a Gawakoto project (sadly I wasn't quick enough to snap up these spats). The Gentle Chief put his ear to the ground and heard the sound of hooves. His many years of experience let him pinpoint the direction they approached from, and the number of men riding together. No longer is he known as the Gentle Chief. The marketing copy on Rubin's site describes the rashguard as possessing a number of features. Some look to be fairly typical for a rashguard, like "Blended fabric (performance spandex/premium polyester)", though I don't have the expertise to distinguish between 'peformance'/'premium' and 'normal' material. 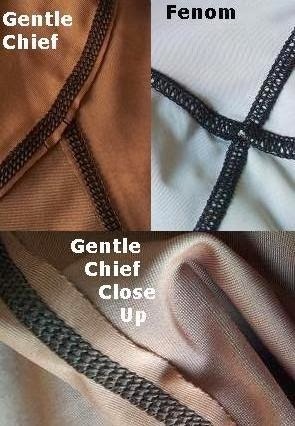 The Gentle Chief is also described as "anti-bacterial, moisture-wicking, and odor-resistant." Moisture-wicking is standard for rashguards, but anti-bacterial and odor-resistance are less commonly highlighted. Having worn this rashguard regularly to training for over three weeks now, I haven't noticed it smell, but then none of the other rashguards I've worn have smelled any different. Of course, something entirely distinct could be occurring at the bacterial level, but I'm not a scientist so that would also be difficult for me to judge. Continuing with that official description, the Martial Arts Supplies site goes on to say that the rashie is "fitted for optimal compression and torso/sleeve length". 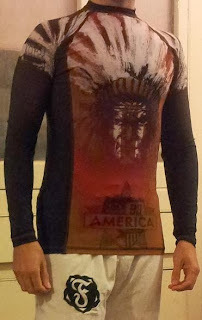 For my frame, it is an excellent fit and easily the most comfortable long-sleeve rashguard I've worn to date (though I have only worn three others previous to this one, along with a couple of short-sleeve models). 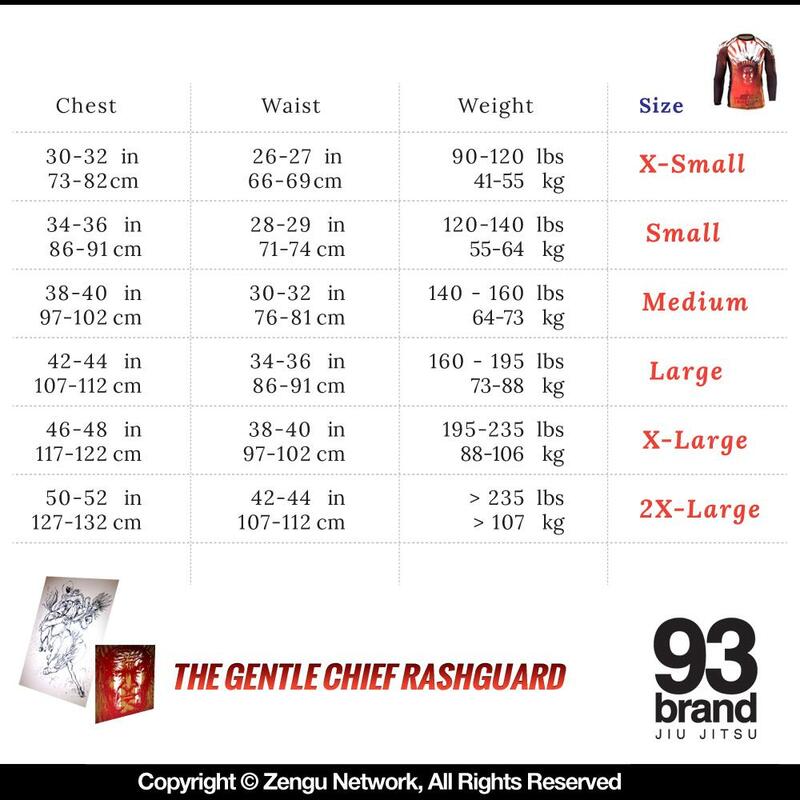 Looking at the size chart (from my experience, you don't have to worry about shrinking with rashguards), I wasn't sure if the medium or the small would be a better fit for me. My chest is 35 inches, I wear 30 inch waist trousers and I weigh 145lbs (so in other words, scrawny ;D). That put me between a Small and a Medium (there is a good range of sizes, from X-Small to 2X-Large), so I emailed Rubin my measurements to get his opinion. He suggested the Medium, which fit perfectly: I'd therefore recommend you contact Rubin directly if you're at all uncertain about what size to buy. Interestingly, the Gentle Chief is also noted as being "SPF 50 for UV protection on the beach, etc," harking back to the rashguard's origins in the surfing world (as I described in depth in my previous rashie review). In case you're wondering, 'SPF' stands for 'sun protection factor.' The not always reliable Wikipedia entry claims there is some confusion over exactly what this really means in practical terms, but either way, 50 is the maximum (in the EU at least). To those keen to avoid the sometimes dubious labour practices of the textile industry, the fact that the Gentle Chief is proudly - and rather appropriately, given the artwork - 'Made in America' is another advantage. Finally, the description boasts that the Gentle Chief has "4 x 4 nylon flatlock seams (triple-stitched)." Looking at that stitching more closely, on the inside it is not what I expected, as normally flatlock stitching results in a tight, neat join. The Gentle Chief rashguard I was sent had material poking out from the stitching: you can see the difference when compared to my Fenom rashguard. I emailed Rubin to ask if it was some kind of defect, and he said that is how all high-end rashguards are made, but that it is normally trimmed: for some reason, the one I've got was not. However, having tested the Gentle Chief for several weeks, I haven't noticed any chafing or discomfort as a result, so it appears to just be an aesthetic question (and given this is on the inside of the rashie, not to mention that this appears to be a factory error, that's not an issue). I've found the Gentle Chief a pleasingly snug fit underneath my gi, providing some warmth as the temperatures cool here in the UK. That's especially appreciated when I'm training at the Hit Fit gym, because it gets quite cold. I'm looking forward to checking out future Gawakoto designs, particularly if the rashguard/spats they adorn prove to be as well-made (untrimmed stitches notwithstanding) as the 93 Brand offering. Available to buy here, or from Gawakoto here.